This Roasted Garlic Parmesan Broccoli recipe is a slam dunk — even for any members of your family who refuse to do vegetables. I made it for two separate holiday dinners; it’s as delicious as it is simple! It was inspired by a recipe in the Food & Wine newsletter years ago and let me tell you, the butter alone is worth making it. It’s not like my love of butter is a surprise, but adding this to your roasted broccoli (or any vegetable for that matter), is a game changer even if you’re not quite as obsessed as me. Each bite is covered in buttery, gooey cheese and that is something I think we can all get behind. I’m very lucky — and a bit dumbfounded — that my kids love broccoli. I wasn’t surprised when they requested seconds of this glorious side dish, and honestly everyone who tried the dish came back for more. I’m willing to bet you’re going to get the same results. Have you tried this butter yet? What are you waiting for?!?! 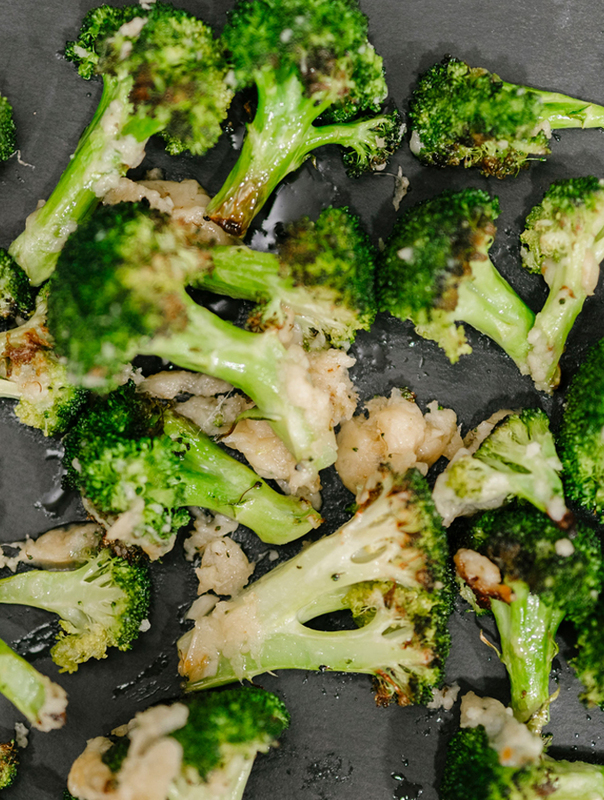 In a food processor, pulse the butter, garlic and cheese until smooth.Roast the broccoli with olive oil, salt & pepper at 425 for 10-15 minutes.Toss with the butter & broil for 3 minutes until the butter is golden.